If you are real a gamer, then you must be burning to know how the graphics of PS4 and Xbox One will stack up against each. You must be very anxious to know the way each console handles lighting, and the texture and detail will be the deciding factor to choose one over the other. However, the release dates of these two next-generation machines are months away, giving us enough time to scrutinize each and every aspect of the two boxes. According to statistics, both Xbox 360 and PS3, which have been around for the best part of the decade, sold over 75 million units. Will the next-gen prove as popular? Both machines have a big legacy to live-up to. Pre-orders in the millions region suggest that Xbox One and PS4 will prove as popular as their predecessors. But which one of the two should you pre-order? 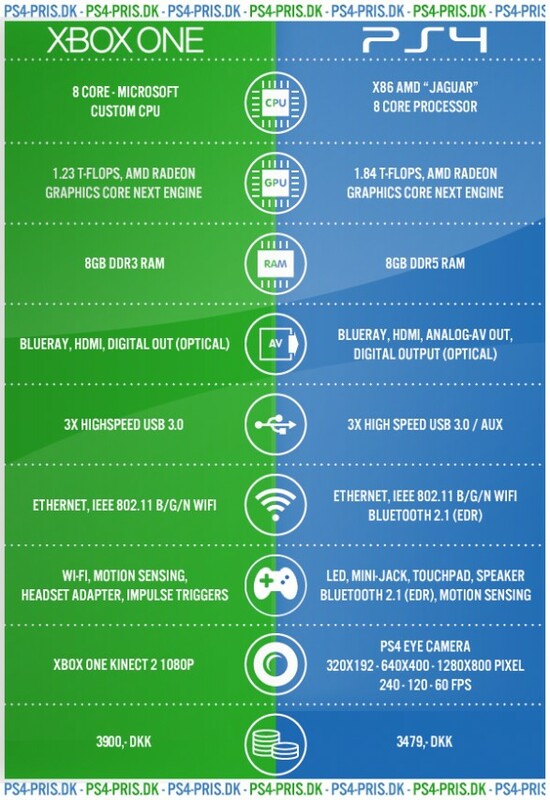 If you are looking for a quick guide on how these two consoles compare so as to make the right decision on which one to pre-order, consider the following feature your cheat sheet. The battle is heating up, but the spotlight is on the most important aspects of these two next-gen behemoths. PS4 features an 8GB GDDR5 memory and an 8 Core Jaguar AMD CPU, TFLOPS GPU 1.84 (AMD next-generation Radeon), 500 GB Hard Drive and USB 3 ports. The Xbox One on the other side, features an 8 GB DDR3 RAM, 500 GB Hard Drive space and an x86 CPU. It has a 3.0 USB ports connectivity, HDMI in and out, 3 separate operating systems that work in tandem with each other, ensuring that things run quickly. In the game world today, the key question for any head-to-head comparison is the graphics of the game. Based on the gameplay demos for Assassin Creed IV, Watch Dogs, and a tech demo from Quantic Dreams’ The Dark Sorcerer, Sony’s PS4 promises nothing but quality game graphics , and top games for the new ps4. Moreover, with an AMD Radeon Graphics Core 1152 shaders GPU, the future is surely bright with PS4. On the other hand, gameplay demos for Metal Gear reveal a stunningly realistic footage on Microsoft’s Xbox One. Demos for The Phantom Pain, Quantum Pain and Son of Rome have all given a nice taste of the Xbox One’s level of detail and sophistication. 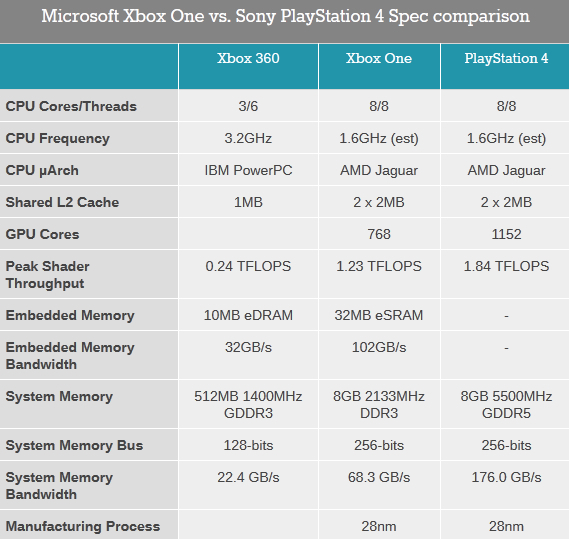 The PS4 and Xbox One have completely different prospects bodywork wise. The Xbox One is larger, while the PS4 is slimmer, sleeker and less likely to dominate the under of your TV space. Other key differences include; the PS4 can be placed vertically or horizontally while the Xbox One on the other hand, must be placed horizontally for the best ventilation possible. Both consoles are black in a boxy design. The two consoles feature understated design touches; the middle strip segmenting the PS4 console’s body, lights blue when it is powered on. Both promise to look adequately futuristic under you TV-stand. Microsoft have made it clear that the Xbox One will require gamers to check in online at least once every day, and they will be restricted from lending out games. In addition, Microsoft will let publishers decide which games can be lent out or resold. On a positive note, gamers from one household will be allowed to share the same account, and the cloud technology will enable them access their library from the Xbox console. The PS4 on the other side, will not adopt the same DRM policies as Xbox One. This means that, when a gamer buys a PS4 game disc, they have all rights to the game; they can share, trade and retail the game or sell it to another person. The Xbox One pads look similar to those of Xbox 360, which is not a bad thing considering the fact that it was voted one of the best looking controllers in the history of gaming. Microsoft however, promises to fix the weaknesses of the old design (d-pad). The Xbox One pad is made from the Kinect technology that makes you the controller as you can track-swivel the pad in your wrists. This is a tremendous progress. The PS4 Controller sees a moderate redesign of the previous PS3 pads, but with an integrated move. The controller is a variant of its tried and trusted Dual-Shock design. The built-in-light however on the top of the edge of the casing can be used as a pointer because it can be seen by the PS4 “Eye”. The controller also has a front touch-pad that can act as a rudimentary display, a fact attributed to by the colored LEDs. In conclusion , it is still close to call. It is hard to pick one clear machine winner. If anything however, the differences between the two consoles are becoming less about the system specs and software and more about gaming preferences. While time will answer all the questions, it is up to the users to decide what best suits them, or their feeling on which console has an edge over the other.